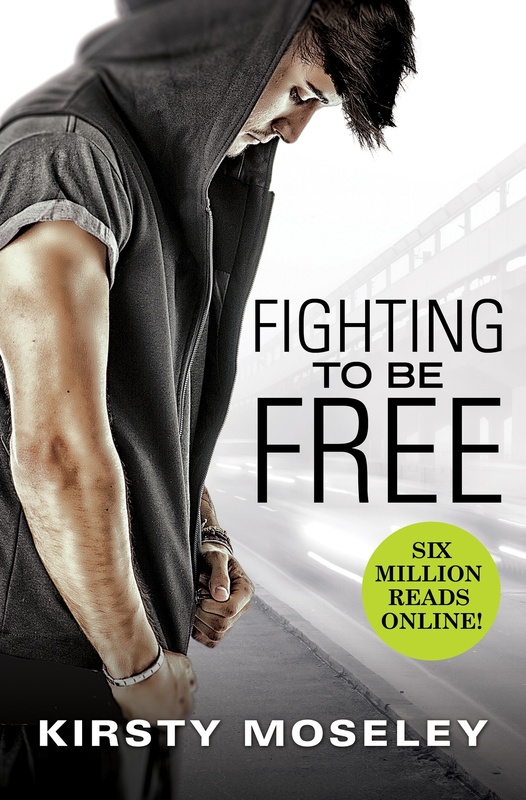 I'm SO excited to be able to share this cover for FIGHTING TO BE FREE. This is my first ever book with a traditional publisher and the book (and it's sequel Worth Fighting For) will be in STORES near you!!! Jamie Cole has just been released from juvenile detention. Determined to go straight, he tried to cut ties with crime boss Brett Reyes--but Brett has no intention of letting him go. Jamie's life is already more complicated than it needs to be, yet when he meets a beautiful stranger at a bar, Jamie knows he's in over his head. Over 6 million reads online, fully revised with new content! The book will also be in shops/stores near you on release!! ALSO – the rights for German, Italian, Polish and Brazilian translations have also been purchased by various publishers so it’ll be out in those languages/countries too!! 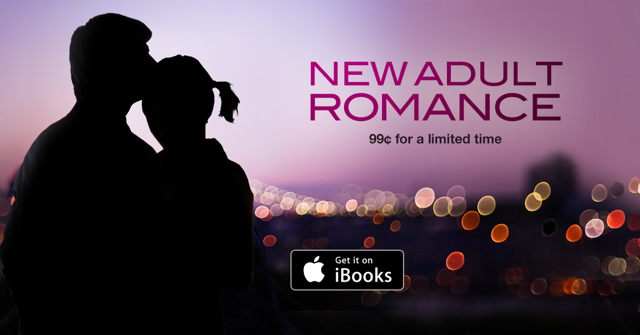 I'm thrilled to announce that NOTHING LEFT TO LOSE is part of iBooks amazing New Adult Romance promotion. It will therefore be on SALE for 99c for a limited time! If you've not met Anna and Ashton yet, now is your chance. Check out Nothing Left to Lose, and lots of other fabulous books at a reduced price, on iBooks today. So, I’ve been keeping a secret for the last couple of months, but finally I’m allowed to let the cat out of the bag!!! So, wait for it….. This will be my first time going with a traditional publisher and I’m so beyond excited about it. Although I’ve been publishing for three years now, being an indie author means I’ve never seen one of my books on a shelf in a bookstore… well, this deal that will change that. It’s kind of like a dream come true. Both books will be published in 2016. Book one is already written - it took me almost two years to write and get it exactly how I wanted it. Jamie and Ellie are two of my most favourite characters I’ve ever created and I can’t wait for you guys to meet them!! Writing it left me an emotional mess, so I feel I put my all into it. I’m currently working on the sequel and just love being back in their world. I’ll keep you posted on pre-orders and stuff, but it’s a little bit too early for that kind of thing yet. So there you have it… Jamie Cole is coming to a bookshop near you!! Squee!!!!!!!!!!! iBooks exclusive box sets at low low prices! iBooks have an amazing exclusive box set feature going on at the moment for a limited time. I have an exclusive box set in there containing three of my stand alone novels (Nothing Left to Lose, Poles Apart and The Boy Who Sneaks in My Bedroom Window), it's called A TOUCH OF ROMANCE. Mine is priced at just $3.99 which is almost five dollars cheaper than buying them separately. Make sure you check it out (and the other fab box sets in there) before the promo ends! COVER REVAMP AND SURPRISE SALE! So here are the beautiful new covers for ALWAYS YOU and FREE FALLING, my 'Best Friend Series'. The gorgeous new covers were made by Hilda at Dalliance Design. I hope you all love them as much as I do!!! Ten bestselling author have come together to help raise awareness of the chronic disease, Endometriosis. The disease doesn't have a cure and many of those suffering have many day to day struggles just to get by. 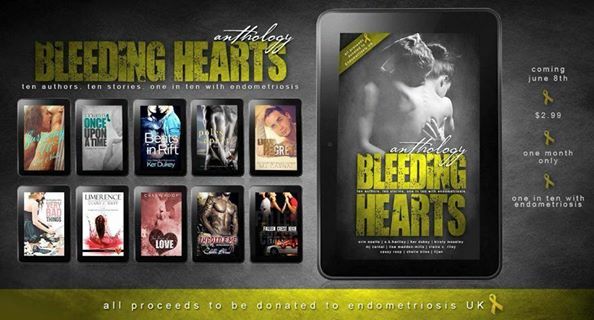 The Bleeding Hearts Anthology is available from June 8th - July 8th with all proceeds going to the charity, Endometriosis UK. Please help us raise awareness of this chronic disease, one that effects one in ten women in the UK alone, but purchasing your copy today. One in ten women endure unrelenting pain that affects every aspect of their lives each day. That's over 1.5 million women who desperately need support and information to help them understand this chronic condition. We're a small organisation, striving for big results. Subscribe to my monthly newsletter and never miss a sale, announcement, or new release again! Plus, as a subscriber, you will have access to exclusive giveaways and sometimes bonus content or teasers. Ooooooh so guess what???? NOTHING LEFT TO LOSE is in a promotion at the moment and it's currently..... FREE!!!!!!!!!!!!!!!!!!!!!!!!!!! If you haven't met Anna and Ashton yet then now is your chance! Poles Apart is now LIVE on iBooks!!!!! (For everywhere else it will be live on Tuesday 18th November). I woke to news this morning that it went straight in at number 1 in the overall paid chart in Australia, New Zealand, UK, Canada and Ireland, and number 10 in the US! That's so amazing, thank you SO MUCH to anyone that has purchased it!